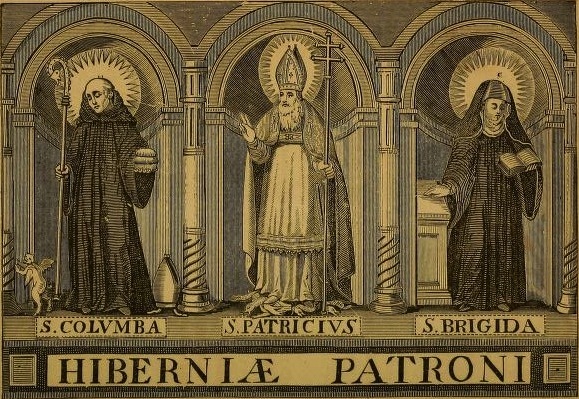 Omnium Sanctorum Hiberniae: Saint Pirminius of Reichenau - an Irish saint? Saint Pirminius of Reichenau - an Irish saint? November 3 is the feastday of the founder of the monastery of Reichenau - Saint Pirminius - whose birthplace is still the subject of debate among scholars today. One tradition is that he was an Irishman, and in the article below, reproduced from the Irish Ecclesiastical Record of 1894, Father J.F. Hogan, champions this claim. Please refer to the original volume to consult the footnotes to this text. Whatever the truth about the national origins of Saint Pirminius, the article is worth reading for the information it contains on the monastery of Reichenau and its famous sons. Censorem genti numen utrique dedit. Huic pro censura tam pia vita fuit. Venit ut hic Marsus, vipera terga dedit. ABOUT a hundred years after the death of St. Gall a large part of the region he evangelized had fallen away from its primitive earnestness in the practice of religion, and had become a prey once more to the ravages of superstition and to the evil instincts of nature. The incursions of barbarian hordes from the north and east had wrought havoc amongst the ecclesiastical as well as the civil institutions of the empire of Charlemagne. The rulers of the Church were seriously affected by this general disorder. The disruption of society on a large scale always opens wide the door to abuses unless they are met with a strong hand and vigorously repressed. At the period of which we write the tide had swept almost all before it. Pastors, as Bishop Hefele remarks, had begun to think more of the wool than of the sheep. Strong belief in the rewards and punishments of a future life had faded away or had been choked and smothered in the turmoil of earthly interests that swayed the minds and the hearts of the people. The beneficent influence of the monastery of St. Gall itself was thwarted and neutralized by persecution and tyranny. It was to cope with the prevailing ignorance and the calamitous results of such a state of things that the monastery of Reichenau was founded in the year 724. Reichenau was the parent house of fifteen or twenty monasteries everyone of which played an important part in the early history of civilization in Germany. From its cloisters came forth monks like St. Meinrad, the founder of the great Benedictine monastery of Einsiedln in Switzerland, which worthily maintains even to the present day its religious traditions of more than a thousand years ; like St. Wolfgang, the noble Bishop of Ratisbon, who preached the faith through the dark forests of Pannonia; like the blessed Etto of Aitenburg, who was taken from his cenobite cell at the call of Charles Martel, and placed over the diocese of Strasburg, which he ruled with admirable success in difficult times, and enriched with schools, monasteries and churches, which attracted the attention and admiration of Europe. Its halls were illuminated by the wisdom and learning of such illustrious teachers as Hermann Contractus, theologian, commentator, poet, musician, and immortal author of the two antiphons of the Blessed Virgin, the Salve Regina and the Alma Redemptoris Mater; as the accomplished Walafried Strabo, whose ability and acumen call forth the repeated acknowledgments and admiration of St. Thomas ; as Berno, the greatest musician of his age, the forerunner of Guy of Arezzo, and the teacher of a host of ecclesiastical youths, who acquired a knowledge of his art, and helped to propagate it far and wide amongst the people.
" Celtica te misit, suscepit Nordica tellus." The opinion is supported with more or less misgivings by such writers as Neugart, Hefele, and Schonhuth. The question is discussed by Dr. Friedrich in his learned History of the Church in Germany and by Duplessy Mornay, in his History of the Diocese of Meaux. The Irish origin of the saint is maintained without any qualification by one of the most learned historians and archaeologists of this century, the late lamented Dr. Greith, Bishop of St. Gall. It was evidently regarded at one time as an undoubted fact by the late Bishop Reeves, although he hesitates somewhat about it in a note at the end of his work on St. Columba, for what reason he does not assort. In addition to the testimony of tradition there are several considerations that seem to us to weigh in favour of Ireland's claim to this illustrious apostle. In the first place, if he had been a native of Switzerland or of any of the parts of Germany that now lay claim to him, it is not likely that his origin and early life would have been allowed to pass so completely unnoticed by the natives of these localities. Had he come from a distance their silence, on the other hand, is easily explained. They could know nothing about his early life, and it was not for him to lay stress on his foreign origin and education. Pirminius, moreover, was thoroughly imbued with the monastic spirit and with the principle of the Irish missionaries that the best way to propagate religion amongst the pagans and to ensure its continued success, was to establish a monastery in their midst. He had the monastic passion as strong as St. Columba himself. No other of the early missionaries established so many monasteries as he did. The English missionaries trusted more to personal action and individual prestige. They were more secular than religious, and although many of them founded monasteries, they never became so thoroughly identified with them as their Irish brethren. Again it is significant that whilst Pirminius had his free choice to select any residence he wished in the lands of his patron Sintlaz, he should have chosen an island in the Brigantine lake which was then overgrown with brushwood and whose only inhabitants were wild birds, toads and reptiles, in preference to any of the cultivated and inhabited parts of the mainland. Here we recognise one of the most remarkable characteristics of the old Irish Church, which, nurtured in the island of Lerins, in the Mediterranean Sea, always turned with particular predilection to the silence and calm of an island life. Arran and Inisfallen, Devenish and Iniscaltra, are but a few examples of the "Holy Islands" which were specially consecrated to religious purposes in Ireland. Iona itself has been called the Lerins of the North. In happy remembrance of these island homes many of the Irish missionaries to foreign lands sought similar retirement wherever they could find it. Nowhere was this more remarkable than in Germany itself, where several small islands in the Rhine were secured for their monasteries by Irish monks. Hohenau, Seckingen, and Rheinau, succeed one another from Strasburg to Schaffhausen ; and for our own part we can scarcely doubt that Reichenau finishes the series, and crowns the list of Irish colonies that were planted and that flourished in the fertilizing waters of the Rhine. Another characteristic of the Irish saint is the "Blessed Well;" and in the case of Pirminius it is not wanting. Neugart tells us about it in his History of the Diocese of Constance. Ac peregrina petens aethera promeruit. Plurima construxit et loca sancta Deo." This title of " peregrinus " was given in a special and almost in a distinctive manner to the Irish monks of the period to which we refer. In several ancient documents Pirminius himself is described as a "peregrinus." Thus in the act of donation, made by Charles Martel to the saint, of the island of Reichenau and of some of the lands bordering on the lake, he and his monks are spoken of as pilgrims who came from the direction of Gaul. It does not matter to us whether this document was invented or falsified in the sense contended by Dr. Karl Brandt of Heidelberg. It is at least a proof of the tradition at Reichenau as to the character and condition of its founders. Again, in a brief of Widgern, Bishop of Strasburg, conferring certain privileges on his monastery of Murbach, he speaks of its inhabitants as " Peregrini," and tells them that if they cannot agree as to the choice of an abbot from amongst themselves they may choose one from any of the other " congregationes peregrinorum jam dicti Pirminii episcopi." In the letter of Theoderic authorising the foundation of this very monastery of Murbach, Pirminius is also described as a "peregrinus." We do not maintain, of course, that the Irish were the only "peregrini " in these days ; but when there is question of "peregrini " in this wholesale fashion and of whole " congregationes peregrinorum," we believe it could only refer to Irish communities. Martvriique sequens misit. perfectio coelo." It was here that the famous abbot, Ermenrich of Reichenau, wrote, in the ninth century, that eloquent tribute to the orthodoxy and zeal of the Irish Church, which according to him was wrapped in the mantle of the Old and New Testament, and was so free from any stain of heresy or schism that it was in itself a diminutive image or miniature of the universal Church. Again, it was at Reichenau that Father Stephen White, the learned Jesuit of the seventeenth century, discovered the oldest and most faithful manuscript of Adamnan's Life of St. Columba. He communicated the work to John Colgan, of Louvain, who published it in his Trias Thaumaturga. At the time of the Revolution, when the monastery was suppressed, its books and manuscripts were scattered and many of them lost. It was by the merest accident that this valuable manuscript was discovered at the bottom of a decayed book-chest in the library of Shafthausen, by Dr. Ferdinand Keller, in the year 1845. We know from other sources that the monastery of Pfeffers, in Switzerland, founded by Pirminius, was also much frequented by Irish monks. It was a station for Irish pilgrims on the old Lucmanian way to Rome. St. Fintan of Rheinau was attracted there by the presence of his countrymen, and his biographer was an Irish monk who lived and died within its walls. Still more did the pilgrims of the west flock to Murbach, in Alsace, which Schopflin calls a " vivarius peregrinorum." Here the Irish monks kept an account of their former teachers and superiors in Ireland. In their annals we meet with such inscriptions as: " 704, mors Canani Episcopi ; 705, dormitio Pomnani Abbatis; 700, mors Cellani Abbatis; 707, dormitio Tighermal; 708, Procus mortuus; 719, mors Eathbodi; 729, Macflathei mortuus." : Were the early annals of the saint's other foundations available, we have little doubt but that they would furnish similar evidence. All these considerations are further strengthened by the weakness of the arguments used against Ireland. Thus Wattenbach's chief objection is based on the un-Irish sound of the name Pirminius, as if it were less Irish than Fridolinus, Columbanus, Virgilius, Marianus. Others, like the historian Hauck, object to Ireland because Pirminius introduced the Benedictine rule into his monasteries. As a matter of fact, the rule of St. Benedict was exactly at that time beginning to supplant the Columbanian rule everywhere, even in the monasteries founded by St. Columbanus himself. With these considerations we leave the question of the saint's nationality. We do not by any means presume to say that it is a matter beyond all dispute ; but we believe, with Bishop Greith, that all the probability and all the positive information at hand are in favour of Ireland. 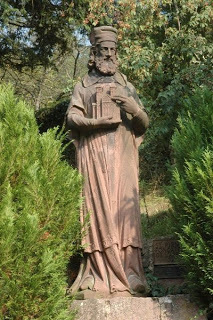 The Life of St. Pirminius was written, in the eleventh century, by Waramann, Count of Dillingen, monk of Reichenau, and afterwards Bishop of Constance, who died in the year 1034. A second biography of the saint was composed by a nobleman named Henry De Kalb, who became Abbot of Reichenau, and died in 1237. The work of the former is published by Browers and Mabillon in their respective collections. That of the latter seems to have perished ; but it still existed in the seventeenth century, for the learned Jesuit Raderus had a copy of it before him when he wrote his sketch of Pirminius in the Bavaria Sancta. From these sources we gather the information that early in the eighth century things were turning badly in the districts of Rhetia and Suevia. Discipline had all but vanished ; religious duties were neglected ; churches had fallen into decay, and their furniture had become squalid and unfit for use. A kind of general licence prevailed which drew away the minds of men from spiritual things. Many had even already relapsed into the superstitions of paganism, so that the most energetic action was required in order to stem, and, if possible, to turn the tide. Fortunately a man of strong faith was found in the country itself to put his hand to the good work. This was Sintlaz, a great feudal lord, whose castle looked down on the Lake of Constance, and who realized the grave importance of a Christian life for his numerous vassals and retainers as well as for himself. Looking anxiously around him in search of an ecclesiastic with the training and spirit of sacrifice necessary to carry out his views, he could not find in his immediate neighbourhood a single one. Determined at any cost to find one, he set out, with a few companions, for Meaux, in France, where Pirminius was already at work. He represented to the saint the urgent needs of his locality, the decline of faith, the decay of the churches, the children crying for bread, and nobody to break it unto them. Pirminius was much impressed with his tale, and particularly with his sincerity and with the manifest desire which he and his companions showed to render all the assistance in their power. But Pirminius was also a cautious man. Although he was then what was called a " chorepiscopus," he did not count much upon his dignity. He reminded his interviewers of the canons of the Church, which forbade an outsider to preach in the diocese of another prelate without his permission. To secure himself against any hindrance of that kind, as soon as he had made up his mind to accept their invitation, he resolved to pay a visit to Rome, and seek the Pope's authority and blessing for his mission. Sintlaz agreed to join him in the Eternal City after a short time, and to urge, if necessary, his demand before the Papal Court. Pirminius was at first received with something like caution and even distrust in Rome. It is probable that the supporters of St. Boniface, whose well-known devotion to the Holy See made him a " persona gratissima " at the Papal Court, fomented this suspicion. He had never got over the opposition of his Irish brethren in the great Easter controversy, and the prejudice he conceived against them onthat account led him into several other quarrels with them in Germany. But " Si Deus pro nobis, quis contra nos." Pope Gregory II., from a personal knowledge of the stranger, soon changed his opinion ; and as a mark of his special favour and confidence, he gave Sintlaz a letter to Theoderic, King of France, advising, persuading, and commanding him to recommend Pirminius to all the bishops in his realm and obtain their consent to his preaching in the countries under their jurisdiction, and doing whatever else he thought necessary for the advancement of religion. Furnished with this authority, the zealous bishop proceeded at once to Switzerland, accompanied by Sintlaz and his followers ; and having secured the necessary consent of the local authorities, according to the canons of the Church and the directions of the Pope, he at once set about his mission. Pirminius was endowed with many natural qualities calculated to win the hearts and to impress the minds of those to whom he addressed himself. He was eloquent and persuasive in his speech, grave, modest and gentle in his manners, but withal firm and fearless in the execution of duty. All who approached him were impressed with the kindness and suavity of his disposition; and the crowds who were drawn at first through curiosity to hear him soon recognised in him the genuine and unselfish spirit of the pastor. When he had by these qualities once secured the goodwill of the people his first concern was the establishment of a monastery which should be the centre of his labours and should be animated by the spirit which had brought him away from everything he loved and cared for in the world. It was then that he fixed his eye on the wild and neglected island which was covered with tangled brushwood, and was then a refuge for fowl, birds, serpents, and snakes. When he proposed to fix his dwelling there, Sintlaz remonstrated with him, and pointed out the impossibility of living in a place which had never been inhabited by man, and which was the horror of the whole locality on account of the vicious and noisome animals that were sheltered there. But Pirminius in his turn gently reproached him for the weakness of his faith. Did not Christ possess all power in heaven and in earth? Did He not grant to his elect to tread on the adder and the basilisk, and to trample on the lion and the dragon? His men were soon at work on the island, before the blessing of the saint and the axes and spades of his labourers, the poisonous tribe soon disappeared. A house was built, and an oratory suited for the divine office arose alongside it. The whole foundation was dedicated to the " Blessed Virgin Mary and to the Holy Apostles SS. Peter and Paul." The island that was once so sterile and rough soon became smooth and fertile. Instead of the briars and tufted brambles fruit trees and vines were planted all around. Civilization of every kind followed in the footsteps of the Benedictine monks, in these days, and soon Pirminius was able to furnish his new home. Forty monks and fifty books are said to have arrived there together. For three years Pirminius and his companions laboured in this fruitful vineyard, renewing both materially and spiritually the face of the country around them. Political troubles then came upon the new institution. Theodebald, the son of a German duke, rebelled against Charles Martel, who was then mayor of the palace under the weak scion of the Merovingians who occupied the throne of France He wished to make use of the monastery and its monks to propagate his rebellious ideas amongst the people. Pirminius firmly refused to lend himself to such proceedings, and was expelled from the island and the country. He appointed Etto, the son of a German nobleman, to take his place, and turned his own energies and exertions elsewhere. It was then that his activity made itself felt all over the central part of the Continent. He founded a great number of monasteries, beginning with Murbach in Alsace, whither he had been invited by Count Eberbard, brother of Etto, his successor in Reichenau, pushing his conquests as far as Altach on the banks of the Danube, and ending at Hornbach, where he had been brought by Wernher, feudal lord of the district. Pirminius, ternisque gregem protexerat annis. Ipsa sepulchra petat, satis ipse probabit in Hornbach." "Christ goes freely and without compulsion to suffer for our salvation. For us He bore insult, blows, stripes, thorns, and treachery. For us He was nailed to the cross. For us He bore that parching thirst which was embittered by vinegar and gall. For us His sacred side was pierced with the lance. At the ninth hour He yielded up His spirit, and blood and water flowed from His side ; the blood for the salvation, and the water for the baptism of the world." The regulations which he lays down for the observance of the people are valuable from an historical point of view, as showing the sort of superstition and the evil practices that were then most prevalent, and the difficulties the missionaries had to overcome in withdrawing the people from such gross observances. But it is with Reichenau that the name of Pirmin has remained most closely associated. He was the founder and the father of that great school that sent forth so many archbishops and bishops in these centuries of the Middle Ages, that nurtured so many scholars, poets, philosophers, theologians. Ziegelbauer proudly tells of the large number of books large for the time that were collected there towards the end of the ninth century. It was there that Walafried wrote the famous Vision of Wettin, and described the "Hortulus" with its herbs and flowers; it was there that Berno wrote De Mensura Monochordi ; that Hermann composed the Alma Redemptoris Mater and the Salve Regina. As many as six hundred monks at one time filled its cloisters. Princes and barons sent their sons in crowds to its schools. Richly endowed by successive emperors, its wealth excited the cupidity and jealousy of the revolutionists of last century to whom it fell a victim in 1799. The island, however, remains still religious and Catholic. The buildings of the monastery are used partly for secular and partly for religious and educational purposes. Its church contains many ancient treasures. In its sanctuary is the tomb of Charles Le Gros, who died there in 888. It is but natural that the whole place should look neglected. Nothing could be more desolate than these lonely cloisters from whose walls the frescoed portraits of ancient abbots and long-departed monks look gravely down, calling back to the soul visions of the monastic virtue of bygone years, and evoking memories that are all the more vivid on account of the silence and gloom that reign through these deserted passages. What different impressions one feels when he ascends the eminence close by. Beneath it hundreds of boatmen ply their oars in the clear and placid lake. On the shore beyond lies Constance, with its historic cathedral, near which one can still discern the hall of the great council that gave peace to the Church in 1414. On the other shore is Gottleben, in the strong towers of whose rugged keep John Huss was carefully immured. If there be on all sides here indications of prosperity and religious civilization, how much of it is not due to the exertions of the great and good Pirminius? On the island, at all events, his services are not forgotten. His festival there is one of the great events of the year; and even though his name should be one day forgotten there, it can never be effaced from the honourable place it holds in the history of Christianity in Germany. THE IRISH ECCLESIASTICAL RECORD Volume 15, 1894, 403-417. Sorry to see you haven't uploaded any more work for a number of weeks! I do hope you are able to complete this very-time-consuming project. Thanks, Seán. I haven't been well for the past few weeks but hope to get back to the work soon. I used my enforced down time to get a bit more reading done so hope to be back in business with the blog as soon as possible.